The Friendliest Airport Around! 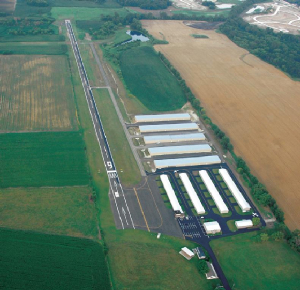 Galt Airport is located in the middle of a corn field, in the middle of America, in the heart of McHenry County, Illinois. Our airport, once a dairy farm, was founded in 1950 by Arthur T. Galt Jr. and immortalized in the 1995 novel by Lawrence Gonzales, "One Zero Charlie, Adventures in Grass Roots Aviation." Mr. Galt began his involvement in aviation with a plane ride to a favorite fishing spot. Art and Vera Galt were impressed by that first flight and the time it saved in getting to the secluded location that previously had been hours away by car. Not long after that first flight, Mr. Galt purchased his first airplane, learned to fly, and used his farm field as a landing strip. Other pilots soon began landing at Galt's field. In short order they were needing fuel and mechanical services. The Galt farm became more of a gathering place for aviators, and less of a place for dairy cattle. In the early 1960's Mr. Galt built hangars and laid down a 3,000' asphalt runway to compliment the north/south grass strip. One Zero Charlie appeared on FAA sectionals and the rest, as they say, is history. Have you ever wondered what it would be like to fly an airplane? Well then, a Discovery Flight is just the thing for you! A Discovery Flight is a great opportunity to "test the waters" before committing to becoming a licensed pilot. It gives you a no-obligation introduction into flight training. For $75 you can take a half hour flight lesson today! Discovery Flights make a great present! If you would like to give a gift certificate, please give us a call and we'll be happy to drop one in the mail or click here to purchase now. For more information or to schedule your flight call us at (815) 648-2433. Galt Airport is also the proud home of EAA Chapter 932. Now hiring Certified Flight Instructors.